Are there people in your life who get on your nerves? I imagine there are! 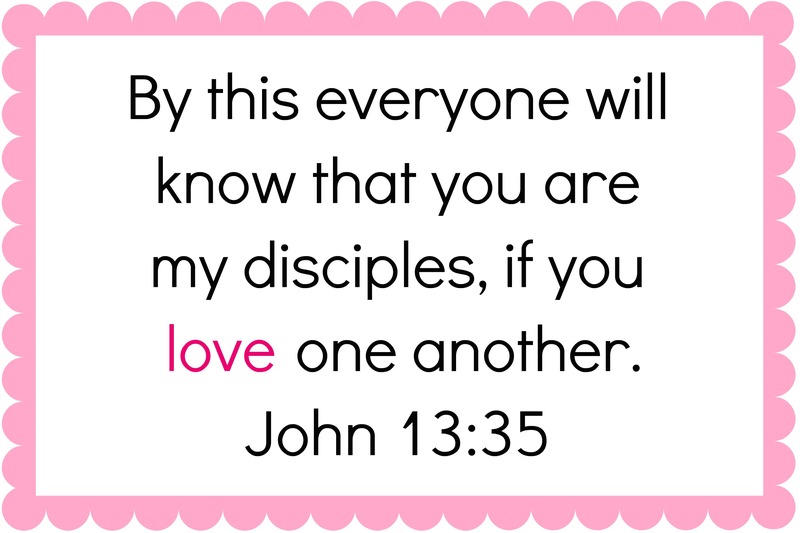 Loving one another is the way the world knows we are Christians. Sometimes I get caught up in worldly things and it is good for me to be reminded that God has standards. He has given me His guidelines to live by. He has told me how I should act. We are NOT TO BE LIKE THE WORLD! We are called to take the higher road…..and that includes in how we deal with people. 1. PRAY! Pray for the person who is driving you crazy. Ask God to bless that person. Confess to God how you feel. Tell Him what your issues are with that person and ask Him to help you! 2. GET TO KNOW THAT PERSON! Take a step towards getting to know the person who is getting on your nerves. Ask them to go to lunch or find a few minutes to inquire about their life. The more you learn about this person, the more opportunity you have to find common ground with them. We all have a life story and you may be shocked about what you learn about their life. You probably have more in common with them than you think! 3. TAKE YOUR THOUGHTS CAPTIVE TO CHRIST! When a negative thought crosses your mind about that person, confess it immediately and ask Christ to replace those ugly thoughts with more positive ones. Quote scripture and keep your thoughts pleasing to God. Don’t allow your mind to entertain negative thoughts about this person….guard your mind! 4. DON’T GOSSIP! Whew! This can be hard. When someone drives us nuts, we want to go “vent” to someone else. We want someone else to help validate the way we feel. Plain and simple—-DON’T DO IT! If you have to, lock yourself in a room until the urge to gossip passes you by. Trust me, I’ve learned this lesson the hard way. Gossiping and spreading ugly information about someone else only makes things worse AND it displeases God. He hates this type of behavior (Proverbs 6:16-19). Although it may feel “fun” at the time, it is wrong and we should not do it. When it comes to dealing with people, we all know that sometimes, personalities clash. Sometimes, we do not enjoy another person’s company. Sometimes, people in our life get on our nerves. 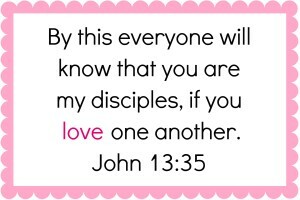 As followers of Christ, let’s remember that we are called to love others and God’s Word tells us that love is patient and kind! Let’s practice patience and kindness as we strive to love those people who drive us crazy. Thanks for reading, my friends! I hope you have a great weekend! Hey Joy!! I have enjoyed reading your devotions! This one really hit home. I plan on sharing this with our women’s group tonight at church. Thank you! I hope you and the family are doing great!! I miss that Sam and those big hugs! I am a Christian and I have a Christian friend I have known since high school. she has done nothing to be but not I don’t want to be around her. she gets on my nerves. I feel at time we have grown apart as she gaines weight and I lose and I want to do things that you have to work, I love to exercise and all she wants to do is sit and watch a move or sit and eat. I feel we don’t have much in common any more except for Jesus. and a lof of the same beliefs and morals. what do I do? I have told God how I feel. I just do not want to be around her and she sits next to me at church. Oh are friendships complicated! I want to encourage you, my friend, to talk with God about this issue as often as it comes to your mind. He desires for His children to live in harmony with one another and although we have struggles with each other from time to time…love in Christ is the strongest bond! I encourage you to examine your heart and your relationship with God. Ask Him to bring to your mind any area you need to surrender over to Him and make sure your relationship with Him is where it should be. Then, focus on the things that you have in common with this friend. Don’t gossip about her, and ask God to help you see the good in her. Ask Him to heal your relationship with her and ask Him to provide opportunities to talk with her, in love, about how you feel. Thank you for sharing this. I pray God will do a mighty work between you and this friend. I can tell you the experience I had with a friend that I didn’t want to be around. I kept asking God why do I have to be friends with her. I felt she was needy. I just wanted to meet her need and keep it moving. My mom told me one day “you need her just as much as she needs you”. At the time I wasn’t trying to hear it. But when she moved away I missed her terribly. So she may be aggy but trust if she’s in your life it’s for a reason. I appreciate where you guys are and make the most of it. Thank you for sharing, Jean! That’s a good word!! Just what I needed for today! Thank you very much for this message. The person who is on my nerves- wasn’t on my nerves until 3 days ago, and then all of a sudden she was. She has not done anything to me, and nothing’s changed, just my tolerance level went from a 9 down to a 2. I’ve been praying to God, and He’s showing me that my own pride has a lot to do with it. For example, she has a tendency to oppose whatever somebody else says- no matter how trivial the subject. In the past, Through God’s grace, I was able to shrug it off and let it go- reminding myself that “it’s just the way she is”. As I started getting more irritated when she wouldn’t just be ‘easy’ and agree with me, The Holy Spirit said to me: “Why does she HAVE to agree with you? Why does she have to share your opinion?…” And slowly I realized that I was looking down on her, and needed to read some scripture about humility. I realize that she’s in my life so I can practice being humble and patient…even if it’s every minute we’re together. You are absolutely right when you say that we should pray for them! God says: “just worry about yourself, and leave that person to Me”. Jesus said to take the plank out of your own eye before you try to get the spec out of somebody elses. Only loving and praying for a ‘difficult’ person will make a difference. So I’ll keep asking God for help, and I won’t stop. We can do nothing apart from Christ. Patricia—I can relate to what you’re saying! I’m so glad God is showing you how He wants you to handle this situation. He will bless you for your obedience and the grace you are showing to your friend! Glad you stopped by my website. That makes it tough Mikala, but God has a purpose for that person being in your life. He may be developing your character and using you to be an example to that family member. Stay in the Word and ask God to strengthen you as you try to respond to this person in a Christ-like manner! Great to hear from you! Stay in touch! Good Article. I rarely say this about articles on the web, but this one is Not Long Enoug! Hi Joy, Thanks for wonderful words. Lord Jesus I needed that! I plan to study this word. This was and is a delivering word for me. Thank I need to read this because I work around mess and it burns me on the inside. At times I have negative thoughts thinking people are talking about me and when they say my name that’s one reason why. I very much appreciate this article. I would add one more point. Matthew 5:44…Do somerhing good for them or to them. Apply love through gifts, help, service…..what ever discernment and wisdom allows. My problems recieve financial help from me on purpose. It keeps our heart tied together. I may never choose them as a friend but I choose to do good.